Amazing or awful, some design details that end up on production cars are just completely ridiculous. These ten laughable design features fall right into that alley. Rolls-Royce knows their customers so well. They understand that if any RR backseat passengers were to come in contact with rain, they would probably just melt. God knows they know that they can’t have that, it would cause lawsuits! The only viable solution to this issue was for Rolls-Royce to install easily-deployable radically expensive umbrellas on the inside of the doorjambs of their vehicles. Problem solved. I love big wings, there’s no hiding that. I love Subaru STI wings, I love Porsche GT3 wings, and I love appropriate race car wings. Unfortunately, the Dodge Ram Daytona’s just doesn’t do it for me. It looks like one of those black backpack strap was just thrown on the end of the bed. Maybe it just needs some more getting used to. Either way, it’s completely ridiculous. It’s because of options like this that Porsche continues to carry the reputation of being able to double MSRPs with just a short selection of add-ons and packages. What are they going to wrap in leather next? The wheels? It doesn’t seem like such a bright (lol get it) move taking the time to design a small detail that almost no one will ever notice. At first it was kind of cool as a rare easter egg, but now this silliness is starting to become a fad across the industry. Let’s just kill it before it it really spreads. Just because the car doesn’t emit some sextastic exhaust noise doesn’t mean it has to look like it should. It used to be that automakers would just add an unnecessary exit to a muffler to make rear-end look sporty. Now they’re just faking it all together! 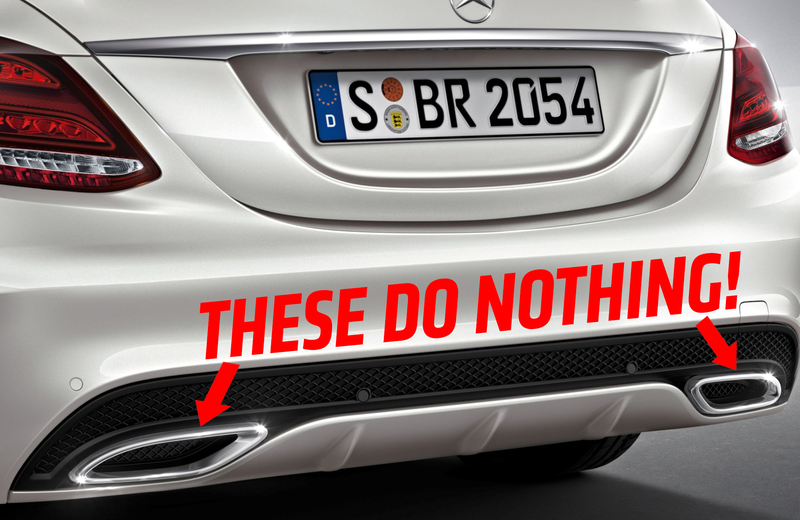 What’s the worst that could happen if a Mercedes-Benz didn’t have an exhaust-exit looking thing? When popping the hood of a car, sometimes it’s nice to see all the dirty mechanical bits because it reminds you that you are actually driving a car. A real live piece of machinery. Why hide any of that? There’s nothing to be ashamed of! It’s not like the people who might actually prefer the plastic covers are ever going to look under their hoods anyways. There has to be some better, more authentic way to throw in design lines and performance-looking things than using completely blocked out air vents. And it’s no longer just an eBay special sort of thing, the best original equipment manufacturers are doing it nowadays. It doesn’t matter whether it’s on a McLaren 650S or a Dodge Ram, either way it’s shameful. Nothing says “look at me, my car is luxurious I swear!” better than a logo being sprawled on the ground by a door-mounted LED projector. It couldn’t hurt to just let the car’s design lines and sounds speak for themselves. The luxuriousness doesn’t need to be advertised on every visit to the local supermarket. Someone remind me, when did landau tops go out of style? Was it 1930? 1935? I can’t remember. One would’ve hoped that they finally would’ve been gone for good after the Lincoln Town Car and Ford Crown Victoria were discontinued, but of course not. This ridiculous looking “style” will continue to live on, and there’s almost nothing we can do about it.